Summer is finally upon us—and with it, break time. Kids are on summer break, parents are negotiating with their schedules to squeeze in a much-needed break, and baseball, that most honored of summer traditions, is headed into the All-Star break. As baseball’s best and brightest stars get ready to face off in Miami, I found myself thinking back to the Chicago Cubs’ stunning 2016 World Series victory last fall. Forget how it all went down? Here, go ahead and watch that historic final out again. I’ll wait. Marketers would kill for the raw storytelling potential inherent in the Cubs’ long legacy (though maybe not the 108-year losing streak). And truly, their woeful tale is something the team has been able to capitalize on again and again. Everyone likes an underdog story, especially one with black cats, the curse of the goat, and poor, poor Steve Bartman. But all these narratives aside, marketers could stand to learn a few other things from the Cubs’ long road to success. Here are three big takeaways. There is no question that Cubs skipper Joe Maddon is exceedingly good at his job. He managed the small-market Tampa Bay Rays to a winning record during his long tenure down in Florida. So it was no surprise when Cubs management immediately snapped him up prior to the 2015 season so he could hone their rebuilding team on the field. Maddon almost played the goat in Game 7 with his quick hook of starter Kyle Hendricks and the curious move to have Baez try a safety squeeze with two strikes, which he bunted foul to strike out. Closer Aroldis Chapman also looked shot after throwing 97 pitches over the past three games, including a potentially unnecessary five outs with a five-run lead in Game 6. In content marketing, the similarities are readily apparent. Unlike baseball, whose basic rules have gone essentially unchanged over the years, content marketing is in a constant state of flux. Because it’s a fundamentally new and developing field, the strategies that worked one day might not work the next. This makes having a long-term strategy essential to the success of your content marketing campaign. And in fact, it’s something a lot more managers should be doing. This strategy should be flexible and adaptive, but it should never stray from the brand’s core mission, vision, and values. It goes without saying that even the best managers are going to slip up from time to time. But with proper alignment and communication of objectives, they can build a team culture where the slip-ups aren’t catastrophic. Speaking of team chemistry, the argument could be made that it was Maddon’s tireless culture building efforts that ultimately propelled the Cubs to their dramatic World Series victory. In Game 7, after blowing a five-run lead, the Cubs found themselves tied at six runs apiece heading into the 10th inning—extra innings. Heightening the drama was good old Mother Nature, whose sudden eruption caused a brief rain delay. And go to 114 they did. As the tarps came off the field, the Cubs stepped up to bat with a renewed vigor and focus. Wasting no time (and shaking off the game’s many missed opportunities up to that point), they tallied the two runs they would need to secure their place in history and wrap up what some have called the greatest World Series game ever. Of course, the Cubs players would never have been in a position to win in such dramatic fashion if it wasn’t for the tireless work put in by the team’s front office over the previous five years. It all began with the hiring of the general manager Theo Epstein—who not a decade prior had helped the Boston Red Sox shake of their own curse with a couple World Series victories of their own. Epstein and the Cubs’ ownership knew the biggest payoffs often require the greatest patience. The road ahead wouldn’t be easy, but the reward would be baseball immortality—and a team poised for long-term success. 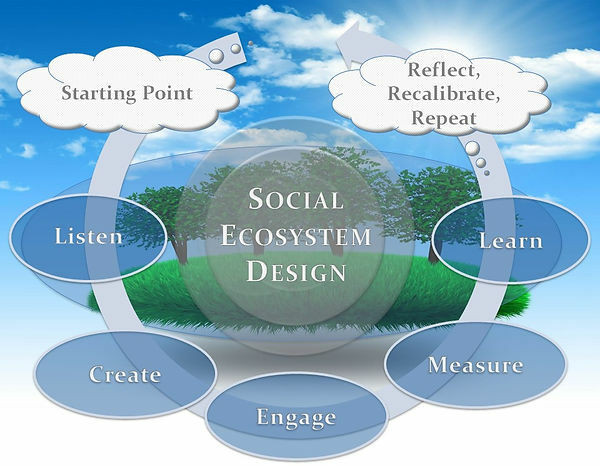 In the Cubs organization, I see echoes of Blue Focus Marketing’s own social ecosystem model. In the social ecosystem, the social governance council (SGC), much like a team’s front office, establishes objectives, identifies key assets, and determines metrics for success. In so doing, they create a roadmap for the future, and through their own advocacy, help to secure buy-in for their vision. Next is the employee experience (EX). At this stage, the SGC works with management, as the front office does with skipper Joe Maddon, to put their objectives into practice through the cultivation of talent, culture, and proven best practices. Even the best blueprint requires the right managers in place to bring it to reality, people who are committed, adaptable, and able to keep an eye on the big picture while overseeing the day-to-day. Then comes the fun part: The customer experience (CX). With proper training and leadership, your team is primed to perform. And the best teams are able to deliver an experience that isn’t just satisfying, but unforgettable. They buy into the process completely and understand that when they’re on the field, they’re not just representing themselves, but the history and culture of their team. As with any properly function ecosystem, this process must be renewed day after day, month after month, year after year. Sure, we may all be celebrating the Cubbies’ accomplishment now, but you can bet that their front office is already hard at work on next year’s campaign—learning, fine-tuning, and acquiring new talent to ensure their team they won’t have to wait another 108 years before tasting glory once more. And if the most hard luck-team of all time can do it, you can too.